AGN - host galaxy relation. We explored the relation between the parameters of the AGNs and of their host galaxies on the basis of a relatively large and uniformly drawn sample from SDSS within a narrow range in redshift. We estimated AGN parameters, like black hole mass and emission line fluxes. Regarding the host galaxy, assessed are the size, colour index, and bulge relative importance. For the individual Seyfert types, the distributions of the host galaxy parameters are studied. Relations between the parameters of the nucleus and the host galaxy are explored and discussed in the context of the Unified Model. BLR geometry. We estimated and analyzed the so called f -factor related to the BLR geometry via comparing the virial products and black hole masses for various AGNs. We initiated a study of the interaction evidence and starburst in the circumnuclear regions of a sample of quasars residing in Ultra Luminous Infrared galaxies (ULIRGs). The main challenge is that nearly all observational tracers used to estimate SF rates (SFRs) in galaxies suffer from severe contamination by emission from the AGN itself, especially for quasars. The star formation parameters (like age, history, and rate) are estimated on the basis of independent methods. We analyse them regarding the AGN - host galaxy relation. In particular, we the ages are compared with the AGN lifetime. We study the relation between AGN and starbust activity on an optically selected sample of SDSS galaxies. They were classified into Seyfert, LINER, H II, and composite Sy+H II galaxies using the standard optical diagnostic Baldwin-Phillips-Terlevich (BPT) diagrams. We estimated various parameters related to both types of activity on the basis of spectral data and studied their distribution regarding the object types. In particular, the composite Sy+H II sample is suitable for the estimation of the relative importance of starburst activity in the vicinity of Seyfert nuclei. Parameters of interacting systems focusing on close companions. Regarding non-confirmed candidate companions, we determined the redshift, using the two-channel focal reducer FoReRo-2 attached at the RC focus of the Rozhen NAO 2-m telescope. In the case of a physical companion, classification and other spectral properties have also been derived. 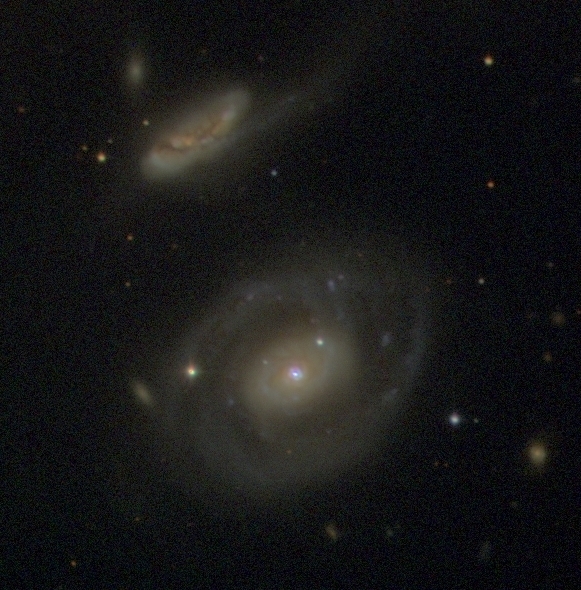 Among the galaxies observed in the course of this study at the 2-m telescope of Rozhen NAO at subarcsecond seeing conditions is the system NGC 7469 + IC 5283 (shown in the true-colour image above). Structures in the outskirts of selected active S0 galaxies. Low-luminosity AGNs have been preferentially found in active S0 galaxies. Besides, BLR geometry is different for bulges and pseudo-bulges. Based upon 2D structural decomposition and various types of maps and residuals of deep optical images, we have revealed plenty of underlying features of a sample of S0 galaxies. We classified their Hubble type given the bulge-to-total ratio. The Freeman type of the disk profile was assessed. Using robust criteria, bulges and pseudo-bulges were seperated. These results were discussed in the context of (i) the evolution of S0 galaxies, in particular the role of interactions, and (ii) the possible relation of nuclear activity to S0 galaxies. Multi-band Intra-night variability of blazars. The blazar class of active galactic nuclei (AGNs) involves BL Lac objects and flat-spectrum radio-quasars (FSRQs). Violent variability across the electromagnetic spectrum is among their main characteristics. In particular, the variability time scales could provide valuable information about the emitting region parameters. We performed temporal analysis of the multi-band intra-night variations of blazars during detected outbursts with the aim to derive the size and physical parameters of the emitting regions. We searched for a time lag between the emission in the individual bands (BV with respect to I) using the z-transformed discrete correlation function (zDCF). The flares were approximated with a double exponential law. We estimated the time scales of the flux rise and decay. We calculated the relative spectral energy distribution (SED) of the variable component. Some of the objects showed achromatic flux variations prompting for geometric effects. For others a ?bluer-when-brighter? trend was observed. This could be an indication that the fast flares are produced by shocked plasma cells (the so called ?shock-in-jet? model). The shock-in-jet model predicts inter-band time lags with the shorter bands leading longer ones. All zDCFs of ours showed asymmetry towards positive lags, i.e., as expected, however, not significant enough. � The rise time scale constrains the size of the emitting region. The Doppler factor was roughly estimated using a one-zone SSC model. The resulting size of the emitting region was compared with the size of the turbulent cells estimated on the base of the numerical shock-in-jet modeling of blazar microvariability light curves. The decay time scale constrains the cooling scale, thus setting limits on the magnetic field strength and Lorentz factor of the electrons. A homogeneous set of global (ellipticity, position angle, inclination, and total magnitude) and isophotal (semi-major axis and colour indices at the 24 V mag arcsec-2) parameters of a galaxy sample have been estimated. They can be further used in various galactic structure studies. A set of bar parameters are also reported. Regarding bar length estimation, we used a method, based on the relation between the behaviour of the profiles and orbit analysis. The so estimated bar length tightly correlates with the semi-major axis, corresponding to the ellipticity maximum. There is a correlation between the deprojected bar length and the corrected isophotal semi-major axis. The deprojected relative bar length and bar ellipticity show no clear correlation. This page is maintained by B. Mihov & L. Slavcheva-Mihova.